Two thousand and seven may be a memorable year for manufacturers of single-engined light aircraft; memorable because it may well be the ""beginning-of-the-end"" of the ""traditional"" light single market globally! Queenstovvn company Air Milford has managed to prove that size doesn't matter — at the same time as it daily proves just how important size is. Sound confusing? Not really. A small company with a big aeroplane - and big hopes for the future = Air Milford leads the way for smaller operators in the politically charged atmosphere of the Fiordland National Park access debate, as Rob Neil found out recently. Bombardier's Learjet 40XR.The name Learket is synonymous with biz jets - a classic design that has been progressively improved since the aircrafts first flight in the early '60's. 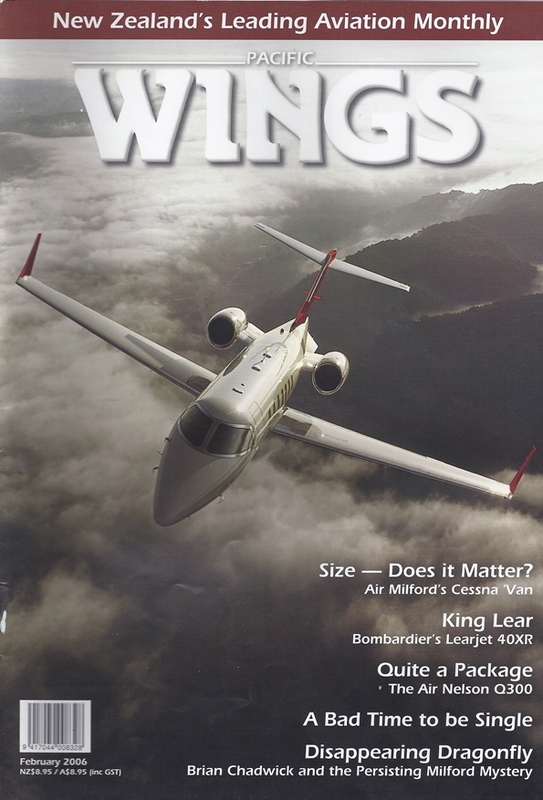 One of the latest derivations is the Lear 40XR — an example of which visited New Zealand's shores in early December 2005 — and Auckland-based 737-300 captain Graeme Mollison found out what makes this enduring type tick. The Air Nelson Q300After more than 15 years of operating the Saab 340, Air Nelson has begun the rare and complex exercise of replacing its fleet, with Bombardier's venerable Dash 8-300Q the chosen replacement. Airline pilot and Wings correspondent Callum Turrell takes a detailed look at Air Nelson's acquisition.